2018 DCSD Girls’ Track and Field Champions — Miller Grove Lady Wolverines make it 2 in a row. 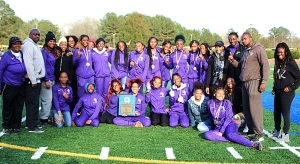 The Miller Grove Lady Wolverines led after the first day of competition and never looked back on the way to a back-to-back title victory in the girls’ 2018 DCSD County Track and Field Championships on Tuesday at Godfrey Stadium. Miller Grove came in as the defending champs and scored 50 points in the field events and 1600 meter run behind win from junior De’Asia Keller in the triple jump (33-09.00), junior Marguerite McGill in the shot put (34-00.00) and junior Emoni Coleman’s repeat win in the 1600 (5:17.35). After a second place finish in the 4×100 meter relay, Miller Grove senior Zariah Kitchens grabbed gold in the 400 meter dash (57.26) to push Miller Grove out to a 70-36 advantage in the team standings. 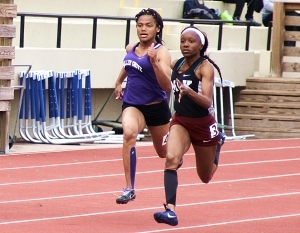 Junior Tacaria Demery picked up silver medal finishes in the 100 meter (12:08) and 200 meter dashes (24.86) and Coleman won her second gold of the meet with a win in the 800 meter run (2:15.00). The medal run for the Lady Wolverines positioned Miller Grove in position for their second consecutive title leading 105-62 over Stephenson with just three events remaining. Angelica Frederick, Kitchens, Coleman and Chance Barnes closed out the meet with an almost three second win in the 4×400 relay with a time of 3:49.91. The 123-85 win over Martin Luther King Jr. gave Miller Grove its third county title in the past seasons including the programs first county title in 2014. Second place Martin Luther King Jr. had a strong finish to the meet as senior Ayonna Dennis (45.13) and junior Jaili Green (46.46) finished first and second, respectively, in the 300 meter hurdles. Junior Kayla Hunt played a big role for the Lady Lions sweeping the 100 meter (11.95) and the 200 meter (24.61) sprints as well as teaming up with Dennis, Green and Lauren Euler to win the 4×100 meter relay (47.08). Other gold medal winners in the track finals were Lakeside junior Emma Hanson (11:30.72) out-dueling Dunwoody’s Samantha Cameron (11:30.78) at the finish in the 3200 meter run and Stephenson senior Simone Harper with a smooth time of 14.93 in the 100 meter hurdles. Harper’s finish aided Stephenson’s third place finish (73) while Arabia Mountain came in fourth (68) behind Attallah Smith’s win in the long jump (18-03.00) and Patra Williams in the high jump (5-02.00). Cedar Grove’s Antania Swain was the gold medal winner in the discus (110-00.00).